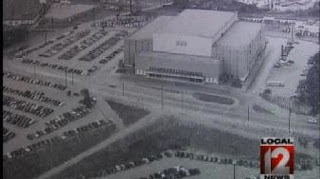 A year ago, John Kiesewetter presented this photo essay on the history of the soon-to-be-demolished Cincinnati Gardens. I recall being at the Gardens twice. The first was for a basketball game between Xavier and Marquette in the 1990s. The other, also in the 90s, was for a concert, the opening act of which was the Newsboys. I was into that band in those days. They would go on to have a steady stream of Christian rock hits, while helping to establish Peter Furler and Phil Joel as solo artists. But it was so early in their careers that when they came out to do an encore, they performed a song they'd already done in their set. It was 'I'm Not Ashamed,' which had sold well as a single. No matter the redundancy, we loved it. As a sinner, I know that someone like me proclaiming the Word of God--both His Law and His Promise--would be the height of hypocrisy except for two things. One is that, other than Jesus Who was sinless, only sinners can proclaim the Word of God. That's the only earthly pool of available candidates God has at His disposal. I come from that pool. And, of course, it is a Word from God that must be preached. As the apostle Paul puts it in Romans 10:17: "...faith comes from hearing the message, and the message is heard through the word about Christ." So, for better and worse, imperfect human beings like me are who get nominated for preaching God's Word. But I am conscious of my sins. Some days more than others. But, like all the human race, I am called to daily repent, that is, turn from my sin, and believer in, trust in Christ, perfect man, God incarnate, and in what He has done for all people through His cross, to destroy the power of sin and death over my eternal destiny. When I entrust my old sins and my present, future, and eternal existence to Christ alone, I am saved from my sin. Acts 4:12 says of Jesus: "Salvation is found in no one else, for there is no other name under heaven given to mankind by which we must be saved." I depend on the grace God gives only through Christ. If I saw myself as anything other than a sinful person whose only hope for forgiveness and life is Jesus Christ, I wouldn't dare take the pulpit. The other reason I dare to take the pulpit is that, it appears and has appeared for nearly four decades, through the affirmation of the Church and an inner compulsion of faith, that I have been called to preach. Called by God. I attended my first seminary class more than thirty-seven years ago, have been ordained for nearly thirty-four. To this day, I ask God whether I heard Him right when it came to my call. I still think that the sermons I've prepared aren't good enough. (Of course, they're not. But God uses my study and prayer to make more of my "not good enough" efforts, it seems.) I still cringe when I hear recordings of my preaching or teaching; how can people stand to listen, how could I have neglected to make that point, why did I let me get in the way of God? And yet, God's call to this sinner continues. No one could be more inspired by this particular example of God's grace than I am. 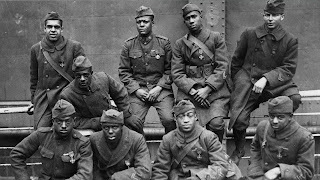 One-hundred years ago, the Harlem Hellfighters, a division composed of African-American soldiers in the segregated United States Army fought with distinction during World War 1, called at the time the Great War. The global conflict officially ended at the eleventh hour on the eleventh day of the eleventh month, 1918. That's how November 11, came to be known as Armistice Day, later Veterans' Day in the US. It was a day of joy that seemed to hold so much promise democracy, especially in the countries who fought for that system of government according to the democratic vision of President Woodrow Wilson. Sadly, after the shooting stopped, Wilson turned a deaf ear to the calls for civil rights from the veterans of the war he had sent them to fight. 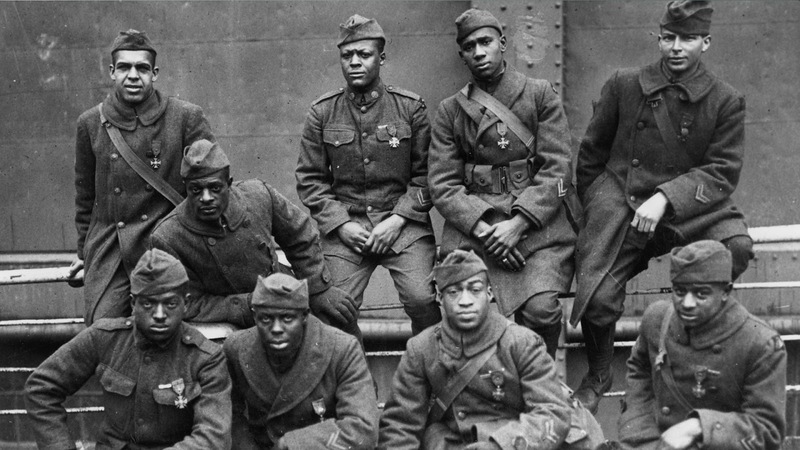 Some of the heroes who made up the the Harlem Hellfighters, the 15th New York National Guard Regiment, were, after fighting to make the world safe for democracy, on returning home to this nation, forcibly subjected to racism, segregation, and, in several tragic incidents, murder by frenzied white crowds. The federal government, under Wilson's leadership, countenanced lynchings of black citizens by whites, North and South, threatened by blacks seeking equal treatment under the law. It had been the hope of African Americans across the country that the bravery in service of liberty exhibited by American black men during the war would legitimize their people's place in the United States and lead to fair treatment. Instead, a white suppression of African-American citizens took place which, in many ways, still exists to this day. As an American and a Christian, that makes me both sad and angry. On July 20, 1969, American astronauts Neil Armstrong and Buzz Aldrin became the first and second human beings, respectively, to walk on the surface of the Moon. They were two-thirds of the three-person Apollo 11 crew. While Armstrong and Aldrin descended to the Moon's surface in the Lunar Excursion Module (LEM), astronaut Michael Collins orbited the Moon in the Command Module (CM), which would eventually take the crew back to Earth. Armstrong was a native of Wapakoneta, Ohio and is part of a distinguished line of Buckeye State aviators, including Dayton's Orville and Wilbur Wright, the inventors of powered flight. Others include John Glenn, the first American to orbit the earth, fighter pilot, and test pilot; Columbus native Eddie Rickebacker, the United States' flying ace of World War I and one-time president of Eastern Airlines; and Columbus West High graduate Donn Eisele, who flew on Apollo 8. After retiring from the space program, Armstrong was a professor of engineering at the University of Cincinnati. The American space program and the Moon landing still inspire me and I still hope that one day that I can travel in space. No one is more realistic about the reality of human sin than the sinless Son of God, Jesus. And no one else offers the path to reconciliation with God and among human beings that Jesus offers to all who follow Him. This is a reflection on my quiet time with God today. For an explanation of how I approach my time with God see here. If the model you find there, taught to us by Navigators, doesn't work for you, I encourage you to find some way that you can get away with God, read and ponder His Word, and pray at least five days a week. It can be transforming to spend time regularly, not just in worship on Sunday, which is an essential part of Christian faith, but also on our own, quietly, attentively. I try to maintain quiet time about five days a week. These are frightening words. They warn believers in Jesus not to be the instruments by which others are tempted into sin. In my life, I can look back on times when I have been exactly that. Jesus’ words call for me to genuinely repent, leaning on the grace that God only gives to those who turn from sin and turn to Jesus as their only hope. Without Jesus, I am without hope for forgiveness or for life with God beyond death. It’s terrifying to contemplate! Jesus also tells me to watch myself. In other words, I need to honestly assess my thoughts, actions, and motives. I need to seek the help of the Holy Spirit to see the truth about myself, so that I can repent. I need the help of the Holy Spirit to run away from temptation and sin. Watching myself means being willing to hear what God, with His perfect insight, tells me about myself in His Word. If I’m open to God, God will grow my faith and my character. Then, I will want to forgive those who sin against me, as Jesus commands in this chapter. But very often, I’m like the twelve apostles who, in response to Jesus’ words in Luke 17:1-3, say: “Increase our faith!” If God would just magically increase our faith, we wouldn’t be susceptible to temptations, we wouldn’t be disloyal to God and so, tempt others into sin. If God would give me a bigger faith, it would be easy for me to forgive. At least, that’s what the disciples seem to think. And, honestly, it’s what I often think. I’ll catch myself in a sin and think, “Why did God let me do that? God should have given me bigger faith.” My first impulse is to blame God, instead of myself. Jesus tells the apostles that the issue isn’t the size of their faith. A little faith (about the size of a mustard seed) in a big, gracious God is all that’s needed (Luke 17:6). In fact, Jesus seems to say that as we seek to walk in fellowship with Jesus each day, we will lose our self-consciousness. In the judgment scene Jesus portrays in Matthew 25:31-46, the “sheep,” the faithful, have no idea what King Jesus is talking about when He lauds them for visiting imprisoned believers, offering water or food to the thirsty or hungry, clothing the naked, and so on. “When did we [do any of those things]?” they wonder (Matthew 25:44). Listen: As I walk more closely with Jesus, I am bound to hear more clearly as He warns me about the temptations I may present to others, the faultiness of my own character and behaviors, and the susceptibility of those who seek to be faithful to self-rigtheousness or dismissive of the seriousness of my own sin. Just yesterday, I said something cutting about another person which presented an invitation to others to join in. It took me a while to realize what I had done. Now, I regret it and repent for it. I contacted several people to whom I had made the comment to apologize for my sin. I need to be open to God both to avoid a recurrence of such sins (and many others) and to know when to seek God’s forgiveness in Christ’s name. “My dear children, I write this to you so that you will not sin. But if anybody does sin, we have an advocate with the Father--Jesus Christ, the Righteous One” (1 John 2:1). Respond: God, help me to focus on following Christ without reference to others’ applause or notice. Help me to be so focused on following Christ that You can freely work through me. Help me to resist temptation and grant, God, that today I will not be an instrument of temptation to sin for others. Help me to simply do what You tell me to do: love You, love neighbor, be a disciple, make disciples. A teacher was known for giving his students brain teasers, scenarios that contained puzzles to be solved. He did this before the final bell on Friday afternoons. “Think about that over the weekend and tell me what you’ve come up with on Monday morning,” he’d say. Most of the students hated these puzzles and didn’t give them another thought once they walked out of the classroom. Some of the students thought about the little mysteries for awhile and then got distracted by other things or simply gave up. But there were other students who jotted down the puzzles and worked them over, often discussing them with their parents and friends over the weekends. Not every kid in this last group solved the puzzle before Monday morning when the teacher revealed the answer, but they were the ones most rewarded for their attention to the teacher’s little mysteries: They gained new insights into how the world works, how their minds worked, how not everything is as it may seem when you just look at things surface-deep. Jesus was the Great Puzzlemaster. Like the teacher who gave his students puzzles, Jesus was always using puzzles--we call them parables--to give us new insights, to teach. 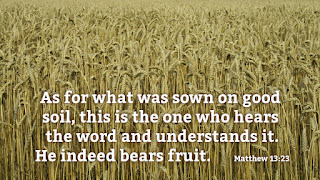 Jesus told parables, stories that used everyday scenarios to convey truths about the Kingdom of God, not to confuse people, but to get them to think more deeply, to help them to see the truth, and to help them to own the truth for themselves. Jesus didn’t make it a practice to spoon-feed truth; He invited people into it, to experience it (and so to learn it) for themselves. Jesus never forces people into the Kingdom of God. Even now, after His crucifixion, resurrection, and ascension into heaven, Jesus will not force us to believe. In His time on earth, He used parables, puzzles that incited people to think things through and consider their deeper meaning, in order to open that kingdom to them. Sometimes, Jesus would later explain the meanings of His parables. But He usually did this only after He’d given His listeners the time to puzzle over them. 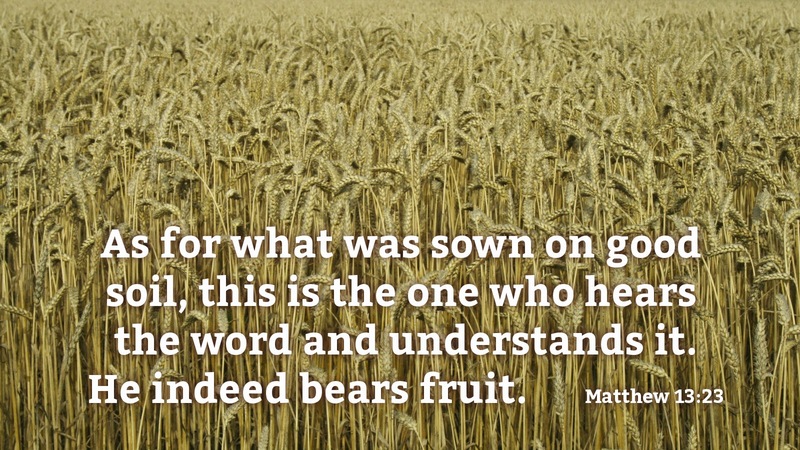 This morning, Jesus gives us another parable/puzzle to consider. In the latter half of our lesson, He reveals its meaning for His disciples, including we twenty-first century disciples. But even there, Jesus leaves us with things to ponder. As I said last week, Jesus doesn’t want us to check our brains in at the baptismal font; in fact, using our minds to discern how best to follow Christ and glorify God is the calling of every disciple of Jesus. Jesus often speaks plainly to those who believe in Him. He can do that with believers, because believers understand that life doesn’t quite work the way most of the people of the world think it does. As Christians, we understand that the whole universe, including ourselves, are born imprisoned in sin and that we need a Savior Who, by His death on the cross, can pay the debt we owe for our sin and set us free to live with God in His kingdom. We understand that the Word about Jesus--the Good News or the Gospel--and our faith in Jesus and the Word about Him is all that can save us from sin and death. But Jesus used parables to tease the crowds into curiosity about the strange, wonderful, eternal Kingdom His parables talk about. It’s possible that many, if not most, of Jesus’ first hearers would have been baffled by this story. Would a farmer be so foolish as to not cultivate and break up his ground before scattering seeds? Would he be so haphazard in scattering the seed? Would any seed yield crops as much as hundred times what was planted? Most would have given up on trying to figure out the puzzle Jesus just gave them. Others, especially the disciples of Jesus, may have thought the story was strange, but because they believed in Jesus, would have puzzled over what was Jesus was telling them. Listen: Being a disciple of Jesus entails engaging God’s Word, thinking about it, praying about it, and discussing it with other Christians. The Word of God gives life when it’s planted deep into our minds, wills, and consciences. And for that to happen, we must be open to God’s Word! The Word of God has to be more than something we hear or read on Sunday mornings or in a Bible study. These aren't ways for God’s Word, the life-giving Word of new and everlasting life for all who trust in Jesus, to get planted in the core of our beings. These aren't the ways that God’s Word impacts our decision making, our attitudes, our parenting, our vocations, our careers, our relationships. Christian faith is not a spectator sport; it’s an ongoing participatory event from the moment we are baptized to the moment we leave this life. We must regularly let God speak to us through Bible reading. Deciding whether to let God’s Word penetrate our lives is life and death business! The disciples heard what Jesus said to the crowds in His parable and they were mystified too. But instead of giving up, they puzzled over it. Then they asked Jesus to help them to understand it. Folks, you and I will never fully understand everything about the Word of God before we leave this earth. The point of getting to know God’s Word isn’t so we can win a Bible trivia contest. The point is to let His truth change us from the inside out as we stand under its authority and its truth. That's what the word understand, which means to stand under the truth and authority of a word spoken to us, is all about. As believers in Jesus, we are committed to standing under the truth and authority of God's Word even as we seek to more fully understand it. And when we’re confused by something in God’s Word, we can do the same thing that our Gospel lesson says the first disciples did: We can ask Jesus. One of the things that the Navigators discipleship process has taught me is that before I read God’s Word during my quiet time, I can ask God in faith, “Lord, help me to see one truth I’ve never noticed before or never noticed in a particular way before.” And, “Lord, what is the thought for living today that You want to give to me through Your Word?” I find that almost always, God shows me things I need to know that day.